Cheddar Bay Biscuits. They are pretty much the number one reason I ever wanted to go to Red Lobster. Unless it happened to be that special time of the year for endless shrimp. Josh and I look forward to that all year long. I can stuff my face with some coconut shrimp and pina colada sauce. Oh Lordy. Of course….good things sometimes must come to an end. Thus I can no longer indulge in basket after basket of fluffy, buttery, cheesy biscuits from Red Lobster. Every now and then I get a super mega craving for something. I can almost taste it on the tip of my tongue. I cant stop thinking about it until that craving is satisfied…and it just grows stronger and stronger turning me into this food obsessed crazy person. My name is Heather and I have a problem. Needless to say, those cheddar bay biscuits were screaming my name. I was making Salmon Cakes (you can grab that recipe on my Instagram) and the smell of the fish and seasonings just smacked me in the face and suddenly, I had to have a cheddar biscuit with that fish. Relying on my very limited baking knowledge, and my very limitless Otto’s Cassava Flour, I mixed and baked and by some miracle created an extremely satisfying replica of those Red Lobster biscuits by the time my fish was done! If you have never cooked with cassava flour, I strongly urge you to do so. This stuff is life changing. There are so so many foods I can finally eat again. My inner crazy person gets to stay hidden away much longer. Clearly I love food. Food is my love language. Food has this incredible ability to bring the most distant memories to the surface. I can just smell a particular food and remember things in vivid detail. Even certain foods and food smells can remind me of a whole time period in my life. We celebrate special occasions with special foods. Thankfully I have learned over the years what foods my husband loves. I mentioned in a previous post that I had tried on several occasions when we were dating to surprise him with an elaborate gourmet picnic, everything from scratch, only to learn that my food was too “frou frou” for his Cowboy taste buds. I quickly learned the preferences of my meat-and-potatoes man. When we went to dinner at my Mother-In-Law’s house, I watched in awe as everything was buttered and fried and hot sauced and delicious. Over time, I merged my northern cooking style with my new family’s down home southern goodness. I have become much better at pleasing my hungry husband. For Valentine’s Day supper tonight, I’m serving one of Josh’s favorite meals. Surf and turf! I’ve got a nice juicy venison steak marinating as we speak, and a dozen raw oysters waiting to be shucked. 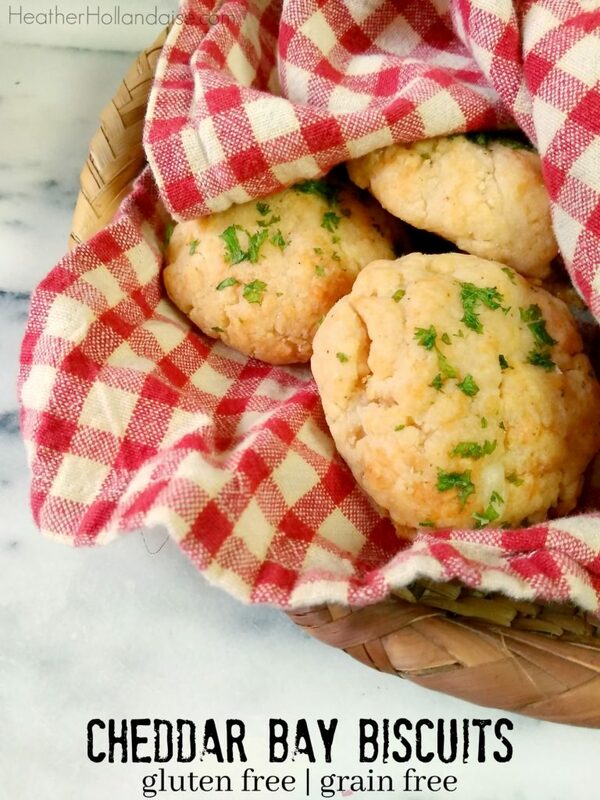 What goes better with surf and turf than a warm basket full of fluffy buttery biscuits? Not. a. thing. In a large bowl, combine flour, baking powder, garlic powder, salt, and pepper. In a separate bowl, combine coconut milk and vinegar. Mix well. Add mixture to dry ingredients and gently stir until moistened. Scoop heaping spoonfulls of dough and form into balls. Place on a silpat or parchment lined baking sheet, slightly flattening the dough with your fingers. Bake for 10 minutes until edges are golden brown. 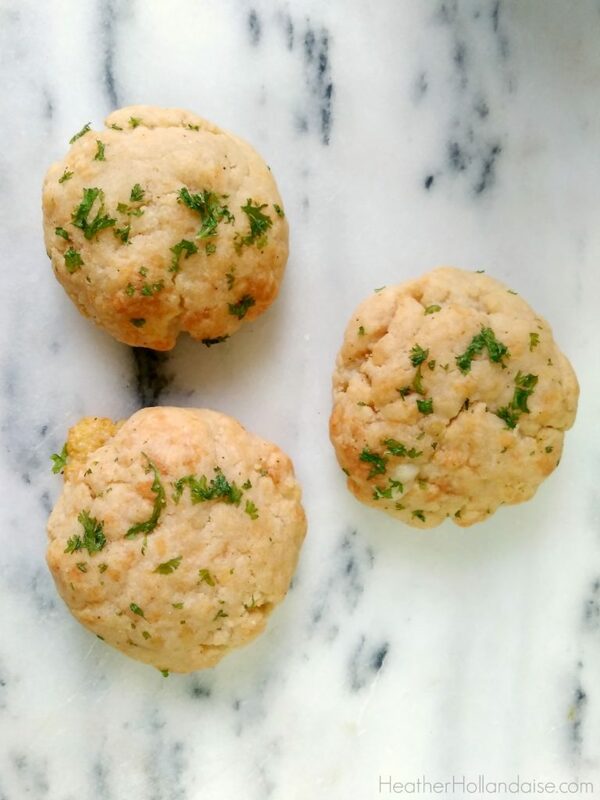 Combine remaining butter and chopped parsley, and brush over each biscuit. Return to oven for 1 minute.